For 'tomb' and enclosure at NJ 4925 1720, see NJ41NE 59. (Formerly classified as Tower-house; Farmhouse; Mill). The site of the old castle or tower of Brux is now represented by the derelict Mains of Brux. The old mill is dated 1711 and the buildings and the farmhouse contain worked stone, some late 17th century, presumably from the castle. The O S Name Book (1866) states that the Mains of Brux was the kitchen of the ' old house ' of Brux. There was no trace of the foundations of the house which were said to have extended from the east end of the kitchen to the NE angle of the garden. William of Newe, related to William Forbes of Brux, died in 1638 (A Laing 1828). A Laing 1828; Name Book 1866; W D Simpson 1948. No further information regarding the site of Tower of Brux (Information from Mr E Forbes, Brux Lodge). A stone on the right of the doorway of the old mill is roughly inscribed with the date 1711. Mains of Brux now derelict. Visited by OS (A A) 11 September 1968. (Classification amended to Tower-house; Laird's House; Farmhouse; Building; Stables). The 19th-century farmhouse at Mains of Brux, which incorporates a laird's house dating from about 1700, occupies the NW side of a yard that also has an outbuilding on the NE. 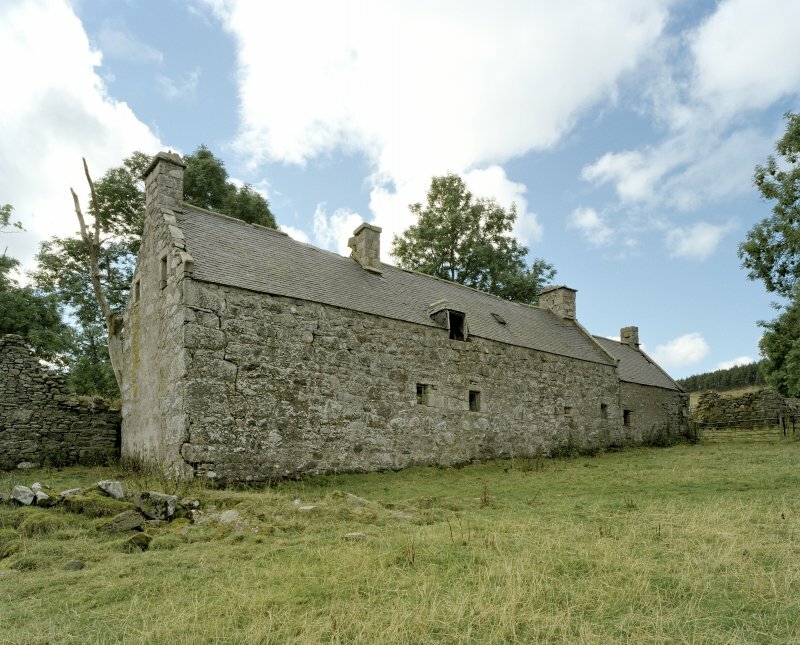 A stable block lies on the opposite site of the track to the SW. No trace now remains of the tower-house, except the two stone corbels of 16th century date that hold up the chimney breast in the SW end of the laird's house. The other small buildings and structures near the farmhouse that are depicted on the 1st edition of the OS 6-inch map (Aberdeenshire, 1869, sheet lxi) have all been demolished. The mill referred to by a previous authority is part of an improved steading (NJ41NE 20.01) that is accessible via a track from the farmhouse, lying 150m to the SW. 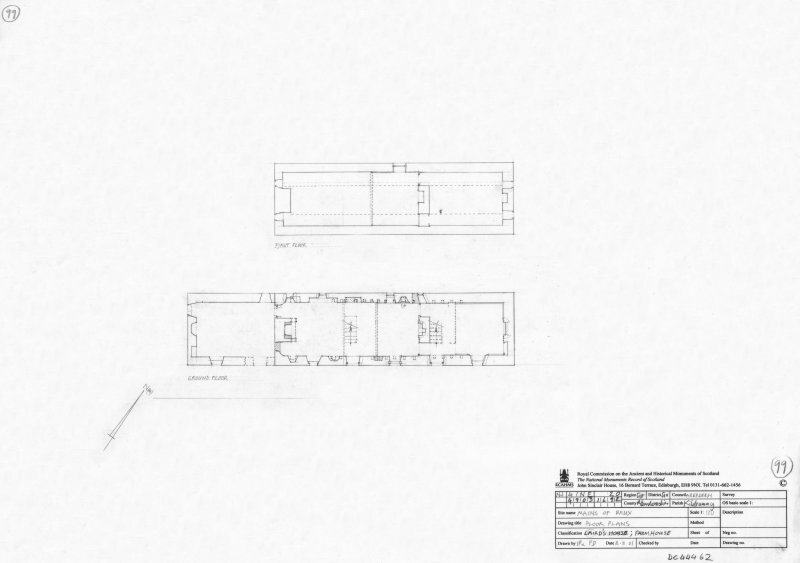 The laird's house comprises a five-bay house of one and half-stories, which measures 17.7m from NE to SW by 5.3m transversely over mortared rubble walls, 0.7m in thickness. Its original entrance was in the middle of the SE side, but this was turned into a window in the 19th century and a new entrance knocked through the former window opening to the SW. None of the original internal compartments have survived the 19th-century modernisation. The roof comprises common rafters, which may be original, but the slate covering is a 19th-century replacement. Two original window lights with narrow, chamfered dressings at either end of the upper floor, and a 19th century half-dormer mid-way along the rear wall, indicates that the attic was used for accommodation. There are chimneys in either gable, each with a distinctive drip course. The chimney at the SW end is deeper and suggests that this was the location of the kitchen. The fireplace at this end was evidently reconstituted in the 19th-century, but it has a lintel with a bolection moulding of late 17th-century date, supported by two late medieval swag-decorated corbels. A blocked window to the left side of the fireplace helped light this end of the building. Four separate presses were noted in the walls of the SW end, presumably to provide storage in the kitchen. Further evidence for the original internal arrangements can be gathered from the presence of a blocked fireplace at the back of the house offset slightly to the NE of the original entrance. This fireplace was framed by a window to either side, each with narrow, chamfered dressings, and indicates that the house was divided into at least three compartments. The window on the right of the fireplace was partly blocked and reworked to create a diagonal embrasure in the 19th century in order to light the back passage into the NE compartment. In addition to the 19th-century changes already noted, a new chimney stack was inserted into the middle of the house and two stairs were built to provide separate access to either end of the house. At the same time the farmhouse was extended 6.4m at the SW end and an internal doorway was knocked through the gable on the NW side of the fireplace; the new extension was also provided with an external entrance. The outbuilding lies at right angles to the farmhouse on the NE side of the yard. It measures 11m in length by 4.1m in breadth within lime-pointed, faced-rubble walls 0.65m in thickness. It sides have collapsed but there is a window opening in the SE gable. The stable block, which measures 27.6m from NE to SW by 5.45m overall, is sub-divided into four compartments and includes a hay-loft and a cart-shed. The manor of Brux was a possession of a branch of the Forbes family from 1409 by marriage to the heiress (Tayler and Tayler 1937), and was raised to a barony in 1504/5 (Reg Magni Sig Reg Scot). The 'mannor house of Brux' was referred to as a gentleman's seat in 1724 (Macfarlane 1906). Visited by RCAHMS (PJD) 16 September 2001. W Macfarlane 1906; A and H Tayler 1937; Reg Magni Sig Reg Scot.